I saw these in the supermarket today and couldn't resist! Do you need me to tell you which glass matches which member of the family...? Today we found the most AMAZING bargains! We were in a local sports shop and there were signs everywhere advertising "End of Financial Year" offers. I saw 2 roller blade boxes on a bargain table. They were marked down from $60 to $30. Now 50% reduction is good but it wouldn't get me excited enough to write a blog about would it? I need my bargains to be way better than that. There was another reduced sticker next to the $30 one. This one said $5! I called Sian over and felt like Prince Charming fitting the glass slipper on Cinderella. These will fit you Sian! Luckily they did. The other pair in the other box fitted Rhiannon. Gareth has just inherited Sian's old skates that she only recently grew out of so everyone was happy. We jumped in the car and raced the sunset home. We did a brief pit stop on the driveway to grab helmets and elbow pads and then carried on to Rathmines park as the sun sank lower and lower in the sky. We promised the kids we would let them skate until it went dark. The sun sets so dramatically quickly in Australia. There is no real twilight it just seems like someone flicks a switch and everything goes dark. They had 30 minutes of skating and throwing a rugby ball back and forth before we could hardly see our hands in front of our faces. We sprinted and skated back to the car as the mozzies descended on us. P.S. How do you know that you are addicted to blogging...? As you drive home your six year old says "I bet you are going to write a blog about this when you get home Mum. I think it should be called: Skating at sunset... "
Lazy Lady and the Magical Cooking Pot of Porridge. Once upon a time there was a lady who lived in a cottage in a far away land "Down Under"
The lady liked porridge. The lady's family liked porridge too. The lady had an alarm clock which liked to wake the lady at 6am so she could make porridge for her family who were still sleeping fast in their warm beds. The lady had to leave for work at 6.30am so she stood and stirred and she stirred and stood as the porridge bubbled and cooked. The lady was cross and cranky. She wanted to look at her emails but the porridge needed stirring. What could she do? She wanted to be a lazy lady who could get out of bed and spoon a delicious bowl of cooked porridge into a bowl and sit down in front of her emails while she ate. She thought about kicking her snoring husband out of bed at 5.50am to cook the porridge but that didn't work. She thought about cooking it the night before but it was too thick and lumpy the next morning. What ever would she do? The lady had heard rumours about a magical pot that could cook a meal slowly over many hours. What if she put her porridge oats, water and milk in this magic pot and it would cook her porridge overnight for her? The lady was very excited. For many days and many nights she talked and talked about the magic pot. Her snoring husband wanted to stuff his ears with cotton tufts to muffle out the sounds of lazy lady's nagging. But lazy lady was a determined lady. She searched the kingdom far and wide until she found the perfect magical pot. It was in a far away glen called Target. The wicked witch of Target normally wanted 87 pieces of gold for such a magic pot. On this fortuitous day the witch was having a 40% off all electrical products and so the lazy lady leapt for joy as she parted with only 47 pieces of gold. She returned to her cottage with a very smug look upon her face. That night the lazy lady put 1 cup of porridge oats, 1 and 1/2 cups of water and 1 cup of milk in her magic pot. She read the magic recipe booklet that came with her magic pot. There was no instructions for cooking porridge and only two choices of heat to cook at: High or Low. Lazy Lady did not want to wake to raw uncooked porridge so she choose high and went to bed. 7 hours later Lazy lady got out of bed in her cozy cottage and crept through the house in bare feet. She opened the lid of her magic pot to smell burnt porridge. The lady flew into a terrible rage and stood with cold feet stirring and cursing and cursing and stirring until a new batch of porridge was cooked in her plain old saucepan. The snoring husband chuckled to himself in his warm bed as her heard Lazy Lady's ranting and raving. That night Lazy Lady tried again but this time she choose low heat. She went to bed and slept, blissfully unaware that he magic cooking pot was once again burning her porridge oats to a cinder. Lazy Lady flew into an even more terrible rage when she realised that her magic cooking pot was full of foul burnt sludge and yet again she had to stand and stir and stir and stand on the cold kitchen floor with cold feet, cranky and cross and unable to check her emails. One temperature-gradually-improving boy wrapped in his dressing gown watching out for the school bus. Hopefully by tomorrow he will be back in school with them. We still have a sick little boy in this house. Temperatures today were still hitting 38.9 Degrees. Gareth spent the day sleeping, reading and wiggling his loose tooth. The wiggling worked! One worry... Can Fairies catch swine Flu? The unexpected arrival of baby twins in our house last week seems a lifetime ago! The little balls of fluff the size of a hens eggs have grown and grown over the week and are now big enough for us to start handling. We know that the more we handle them the better pets they will make for future owners but it will make it harder and harder to let them go when they are old enough to be separated from their parents. Tempting as it may seem to keep them all together I think if we did we would be over-run by babies as they become mature enough to get pregnant at the grand old age of 4 weeks! Here are Sian and Rhiannon playing with them this weekend! If a picture speaks a thousand words this is how I want to grow old! P.S: Great Anniversary Card Mum and Dad! I hope you don't mind that I stole the picture on it for this blog post! We loved it. Today marks our 13th Wedding Anniversary. We booked a babysitter for last night so we could celebrate child free at a local restaurant. A few days later an invitation arrived in our letterbox for a friends party on the same night. We abandoned all thoughts of the restaurant and I went shopping for a dress and sparkly high heels. With Gareth under the weather we had a real dilemma. To go or not to go? I rang our babysitter and talked to her. We agreed a plan. She arrived as planned and we went out leaving a cozy pj-wearing Gar curled up on the sofa watching a film. I agreed not to drink so that I could be home within 15 minutes of a phone call if needed. We had a wonderful night. Dancing, mingling, laughing. Byron had an amazing selection of drinks in his hand over the evening. Champagne and cocktails of every colour under the rainbow. I was happy to have one glass of bubbly as we arrived but stuck to non-alcoholic for the rest of the evening. The phone didn't ring. We got home in the early hours of the morning to a quiet house with sleeping children. It was a lovely start to our Wedding Anniversary celebrations! We often get accused of living a "perfect life" because the blog is full of happy stories and photos. Occasionally I like to bring the blog back down to earth with a bit of a reality post. Today we have a sick boy in the house. He came home from school yesterday feeling hot and tired. Overnight he got hotter and when the thermometer read 38.9 degrees we decided we needed advice. We got an appointment for him at the Emergency out of hours GP clinic. Within a few minutes of being in the consultation room the GP left and came back in wearing a mask. She had in her hands a big manual of advice from the department of health about the Swine Flu epidemic. There were some phone calls about whether he should be given the TamiFlu anti viral medication. The Australian government has just gone from "Contain" to "Protect" mode. This meant that a week ago our family would have been placed in house quarantine. Today's advice was much less dramatic. He has all the symptoms of a "Flu-like illness" so he has to stay in our house and avoid contact with any vulnerable groups, sick, pregnant, immuno compromised etc. The rest of us are fine to carry on with normal life. We can go to work and the kids can go to school. People can come in and out of our house as long as they are not in the vulnerable category. Gareth will be able to go out and about as soon as his temperature returns to normal. He won't be tested for Swine Flu as per the Governments updated protocol. He wont have to take the course of TamiFlu as he isn't in a vulnerable category. He just needs lots of children's paracetamol and ibuprofen and lots of drinks to keep him hydrated. Despite this post sounding very dramatic Gareth wanted to share one last photo with you from when the paracetamol kicked in! Yes, he may look a bit under the weather but he is still in fun spirits! 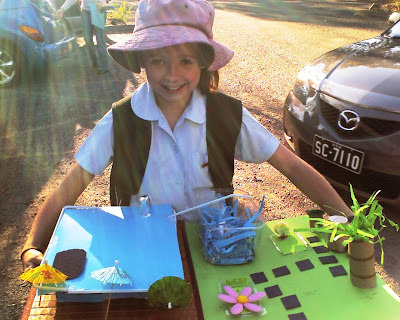 Sian's teacher Mr Jennings gave his class a project to do this week on Eco friendly living. They had to design and build a house that would have Eco aware structure and garden. Her house had a massive water tank to catch the rain that landed on its roof. It had whirlygigs to aerate and cool the house in summer, solar panel, shade areas and veggie and compost areas in the garden. I think it is fantastic what they study in school. Maybe someday this will be where Sian lives! This week Gareth had to do a presentation in front of his classmates about his favourite Australian animal. When we had established that Cheetahs and turtles were not truly indigenous to Australia he decided that he would do his presentation on the Saltwater Crocodile! He sat down and read up on this delightful creature and wrote out all the info onto scrap paper. I later typed it in simple-to-read font onto little "Palm cards" as requested by his teacher. We printed out a picture we found on Google. He practised and practised his 2 minute speech in front of us this weekend and went into school excited and confident. He came home from school waving a certificate for being a Star Speaker! It will be the baby guinea pigs one week birthday tomorrow and the kids will be allowed to touch them at last. They will only be allowed to use one finger to stroke them down their back gently but the excitement is almost unbearable! I had a chance to see them yesterday when I was topping up the food for the adults. They seem to have doubled in size. We had problems with one of them the first night it was born. It was so small it managed to squeeze out thrugh the narrow bars of the hutch into the garden. We had to buy plastic mesh to place over the existing sides to make the hutch escape-proof. Hopefully the babies are now big enough that they can't squeeze through! It is cold and rainy today. The brief reprieve of sunshine at the weekend was just a tease. Winter is still well and truly here. In the Sheeran family we have a tradition of "Miserable Mugs" They are various cups and mugs we have bought for each other on occasions like birthdays, Mothers Day etc. They are not meant to make you feel miserable but are to be used when you are miserable to cheer you up. The ones we have sent over to Ireland have had photos of the kids on or have been decorated by them at school. I recently got my very own "Miserable Mug" from my sister Carrie. We actually managed (from opposite sides of the world) to buy each other the same mug from Marks and Spencer's. It is a beautiful white mug with red hearts on it. I am supposed to use it when I am grumpy and she supposed to too. I bought Byron his very own "Miserable Mug" with it's own cheery phrase! ...a note left by Rhiannon for me to find! Mr B was in for a surprise this weekend. The Macquarie Roos normal coach was away and he was filling in for one of their three matches on Saturday. He needn't have worried. He was great and if anything was very calm with his advice to the kids on the field. He seemed to find it funny having them all follow him around like the pied piper! "Can I have turn kicking the ball? Can I have a turn...? Can I have a turn...?" He was very proud that the team won that game and naturally attributes all some of this to his amazing coaching skills! Sian has been an Altar server at St Josephs for two years now. She started at the same time as her friend Gemma. They both take it very seriously. They have the perfect facial expressions of reverence all through Mass and float effortlessly from spot to spot doing all their jobs in perfect synchronisation. Now, two years later the younger siblings have been asked if they would like to be trained as Altar Servers too. Rhiannon and Sophie hand wrote their letters to the school and were accepted into the training along with a few of their friends. They did their training last week and were chomping at the bit to get a chance to do their first Mass. This week was it! The excitement as they got dressed in their robes was HUGE! Most of the robes were really big and long and we struggled to find two that they wouldn't trip up in. I went back to my seat and nervously waited for Mass to begin. Monica (Sophie and Gemma's Mum ) was sitting just behind me. The first half of the Mass went really well. The girls walked up the aisle to the Altar carrying the candles, set them down without incidence and sat solemnly in the chairs with appropriately serious faces. At the blessing of the bread and wine they rang the bells at the correct time and passed the bells on promptly to the next person. Finally it was the big build up for communion. They lined up and were offered the host and then.... the Wine. Both girls faces were grinning as they waited for their turn. We had talked to them in advance and given permission for them to have a sip but only a sip. The first senior Alter Server raised the chalice briefly then returned it to the priests hands. Sophie raised the chalice briefly then returned it to the priests hands. Rhiannon... How can I describe this... Rhiannon raised the chalice to her lips, paused, raised it higher, paused, raised it higher again, paused. It looked like she was drinking back a pint of water after a marathon. I could feel the giggles building up inside me and I tried so hard to keep my face neutral. I leaned against Byron for support and he squeezed my arm back with a grin on his face. I heard the muffled sound of I'm-trying-to-hold-it-in-but-I-can't laughter from behind me. I looked over my shoulder to see Monica wiping tears of laughter from her eyes. That did it for me. My shoulders started to shake and I just managed to hold off collapsing into laughter until the rows of parishioners started to stand up and file out to the aisle to receive Communion. When I asked Rhiannon afterwards what on earth she was doing she said "Mum there was hardly any wine in the chalice and it was heavy. I tried to drink some but it wouldn't come to my mouth so I had to raise it higher and higher until it did" She might only have had a tiny sip but I think it went to her head as for the final ten minutes of Mass she couldn't sit still. She wriggled and jiggled, rotated her feet this way, then that, looked up down and round about then wriggled and jiggled some more. She had definitely reached the end of her concentration span! After Mass she proudly hung up her robes and came back out to join us. Fr Tom very graciously praised them and gave them 10 out of 10 for effort! It's all a learning curve I guess. And that is the story of how my Rhiannon started her journey to becoming a nun. Maybe I'm getting carried away! I brought my little Altar Angel home and made her a big cup of hot Milo before putting her to bed, halo glowing! Today I came home from work to some very unexpected news. Sian, Rhiannon, Gareth and Byron stood in the hallway with grins from ear to ear. Today two tiny babies were born in our house. Well actually our garden if you want to get technical about it. Yes, Splodge the Guinea Pig that joined our family a couple of months ago gave birth to two little balls of fluff sometime today while the kids were in school. We didn't know that Splodge was pregnant. We thought we had two female Guinea Pigs. Maybe Splodge came to us already pregnant (trying to Google the Guinea Pigs gestational time to answer that one!) or that Jaffa is not a "she" as we thought but a "he" Or maybe Jaffa gave birth and the question of male V's female applies to Splodge...? I'm so confused. We rang the local pet shop for advice. So far we have learned that we must stay away and leave the Guinea pigs in peace and quiet for a couple of days, just opening the cage to top up the food and water. We need to give the new Mum extra sources of vitamin C. We must not touch the babies for at least a week or our smell on them might make the mum abandon them. I am itching to see them. Byron and the kids got a glimpse earlier before they knew to stay away. They said each baby is about the size of a hens egg and covered in white fur with brown and orange splodges. They have big pink ears and are sooooooo cute! I wish I could see them myself but they are hiding under the bedding. When I get close enough to take a photo I will post it here but for now you will just have to be patient and use your imagination!